Novation Launchkey (MK2) is the quickest and easiest way to produce and perform electronic music using Ableton Live. You just plug in via USB and the keys, faders, knobs, and velocity-sensitive RGB pads give you immediate hands-on control of your session view, instruments, effects and mixer. 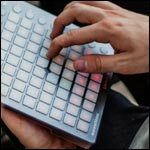 Launch clips, control FX, play beats and much more using 16 pads laid out in two rows of eight, to match your Ableton Live session view; one row to launch clips, and one row to stop them. Full color RGB LEDs mean they’ll match the color of your clips too, while velocity-sensitivity lets you really put some feeling into your beats. Launchkey is designed to let you shape your sound however you like. Use eight rock solid rotary knobs to tweak your instruments and effects, and nine dedicated faders for hands-on control of your mixer. The 49-note synth-style keyboard is lightweight, fast and very easy to play, but also velocity-sensitive so you can create truly expressive performances. All the controls integrate seamlessly and immediately with Ableton Live, and can be reassigned to anything. Of course, if you do not use Ableton, it will map to other major music software using In Control. Launchkey 49 is tough enough to take and use anywhere. It will work the moment you plug it into your laptop and you won’t need any drivers or power cables, because it’s class compliant and bus-powered via USB. Launchkey comes with absolutely everything you need to start making music: Ableton Live Lite, Novation Bass Station and V-Station virtual instruments, plus a comprehensive 1GB collection of production-ready samples from world-leading sample store Loopmasters. 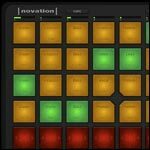 Launchpad Mini is the compact version of the celebrated Novation Launchpad performance controller. Designed for the iPad generation, Launchpad Mini features 64 three-color launch pads that let you play loops, sounds, effects and more to produce and perform music immediately with your iPad, PC or Mac. Designed to get you making music right out of the box, Launchpad Mini is entirely bus-powered from your iPad, PC, or Mac. It comes with a suite of software, including Ableton Live Lite, for your Mac or PC, plus the Launchpad App for iPad. Launchpad for iPad includes a pre-loaded professional sound library that you can use instantly to create unique performances, turning Launchpad Mini into an integrated performance instrument. In addition to the built-in sounds, you can import additional sound packs or even your own sounds when you need them. Complete your performance with filters and DJ style effects, and then share your creations with the world. 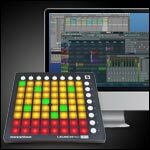 Launchpad Mini’s brightly illuminated grid of 64 three-color pads can trigger loops, samples, and events as well as controlling effects on your iPad or computer. Launchpad Mini integrates perfectly with Ableton Live, just like the Launchpad S. Trigger clips and scenes, control volumes and sends and much more — and Ableton Live Lite is included with your Launchpad Mini. 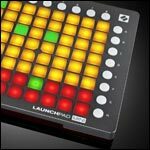 Plus, get hands-on control of FL Studio 11 using Launchpad Mini’s 64-pad grid. Stickers are included to label the keys as you want. Produce and perform music instantly on your Launchkey Mini with the included Launchpad app for iPad with its built-in samples, loops and effects. Import your own sounds or choose from a constantly updating library of premium packs to launch. Launchpad Mini is both compact and sturdy enough to withstand life on the road; it’s easy to transport and instantly ready to perform. It’s lightweight too–smaller and lighter than an iPad. Launchpad Mini is also totally bus-powered; there’s no need for a power socket whether on your iPad or computer. Control Ableton Live (Lite version included), FL Studio and a wide range of additional DJ, VJ and music software. And use multiple controllers for even more flexibility. Part of the growing range of Novation Launch products. 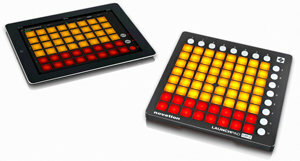 Launchpad Mini is part of the growing range of Launch products from Novation. Use multiple Launch family products together to unleash awesome performance possibilities: pair Launchpad Mini with its big brother, the Launchpad S, enhance your lead or bassline capability with Launchkey or Launchkey Mini performance keyboards, and add high-quality rotary controls with Launch Control. Use them together with the Launchpad and Launchkey Apps for iPad.